Fighting Things In Space: The Game! Fighting Oversized Pretzels: The Game! 1986 was still pretty early into the Mark III/Master System’s lifespan, yet the system had already garnered some non-traditional shoot-em-ups. 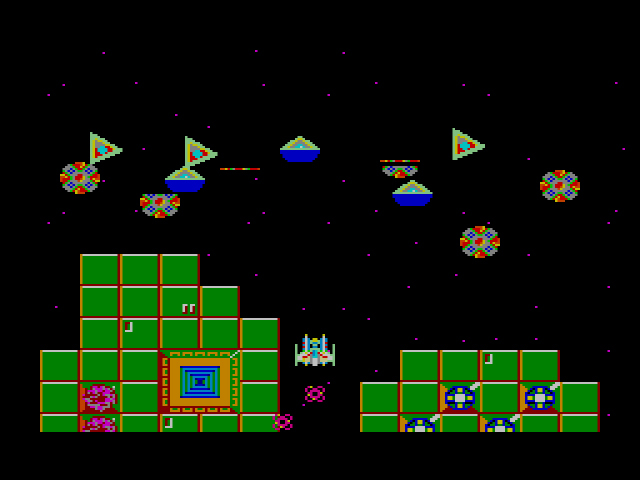 Fantasy Zone was a deep shooter masquerading as an epileptic nightmare for children, while F-16 Fighting Falcon was a first-person computer flight sim shoved onto an 8-bit cartridge. Astro Warrior, however, is rooted so deeply in early shmup tradition that it stumbles over its own classicism. With the exception of the sharp graphics and stupendous framerate, the game plays like it sprang straight from the antiquated loins of the SG-1000. To be fair, the SG-1000 would have balked at this amount of action on-screen. And by “balked,” I mean, exploded. Early shoot-em-ups gave the player very little: sparse backgrounds, the same repeating enemies, few levels or power-ups. Astro Warrior adheres very strongly to this less-is-more tradition, while making a few transitory concessions – like large bosses – along the way. Your spaceship travels vertically and is equipped with a rail-thin laser to help you deal with the various baddies. The bad guys are your standard “early shmup” shapes – triangles, circles, squiggles – and they bounce around the screen in various patterns for your amusement. You do have weapon upgrades that look like ships and could be mistaken for an enemy, if you’re not careful. Upgrades increase the power and width of your laser, help your ship move faster, and also provide you with two helper ships that straddle your side. The helper ships have the same weapon as you, fire when you fire, but they can’t be killed. They’re great to have alongside you while you fight, but they might make the game a little too easy. Then again, if you die, they die with you, so perhaps it all evens out. 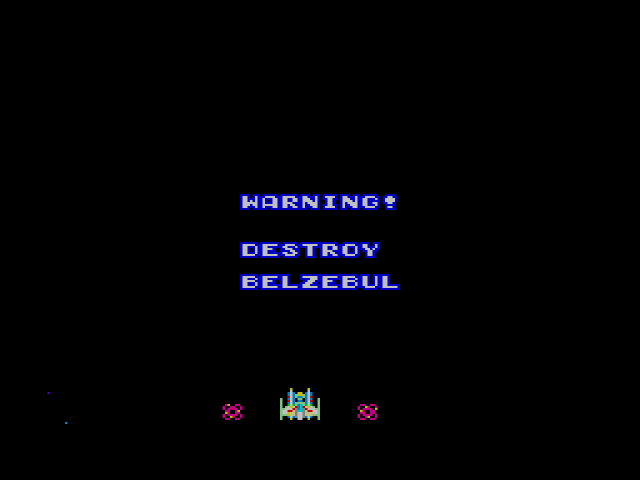 The helper ships, along with the large bosses that would become a staple in the shmup genre, are the only real features in Astro Warrior that hearken to the time of the game’s release in 1986. None of what I mentioned in the last paragraph is bad, per say. Simple, yes, but the game moves at a quick pace and it plays well enough. The main problem is the levels, or lack thereof. After you beat the third level, you might think to yourself, ‘Alright, Astro Warrior is starting to pick up speed’ but alas, the fourth level repeats the first level with harder enemies. 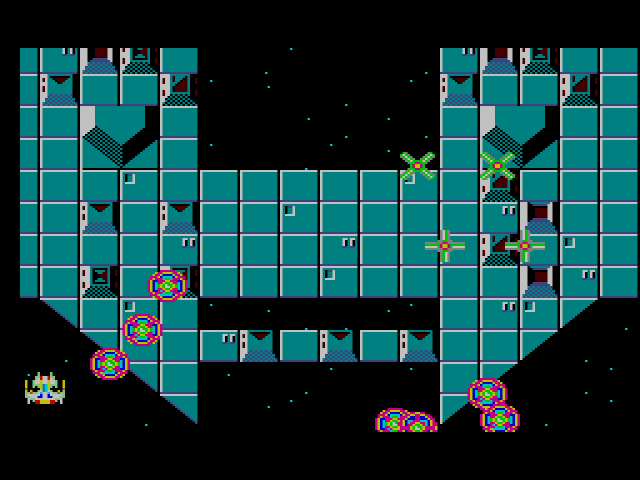 The game has only three unique levels – Galaxy Zone, Asteroid Zone, and Nebula Zone – before it repeats itself. Even for the time, this lack of content is a gyp, and Sega knew it. Consider: Astro Warrior may have been released as a single cartridge in Japan and the States, but Europe only saw the game on a combo cartridge, Astro Warrior & Pit Pot. And, as if to apologize for initially releasing the game by itself, Sega later re-packaged Astro Warrior with Hang-On in the States. Astro Warrior isn’t a poorly developed game, but an inconsequential one that feels out of place on the Master System. It wouldn’t surprise me to learn that the game started out as a late SG-1000 title before being pushed to Sega’s new 8-bit console. And compared to all the progressive games Sega was churning out at the time – the aforementioned Fantasy Zone, Alex Kidd in Miracle World, Pro Wrestling – Astro Warrior is a small step backwards to Sega’s early arcade roots. Good enough for those robust gaming warriors who love collecting points, skippable for everyone else. The best version of Astro Warrior. That is indeed a frog ship fighting with some old boots. 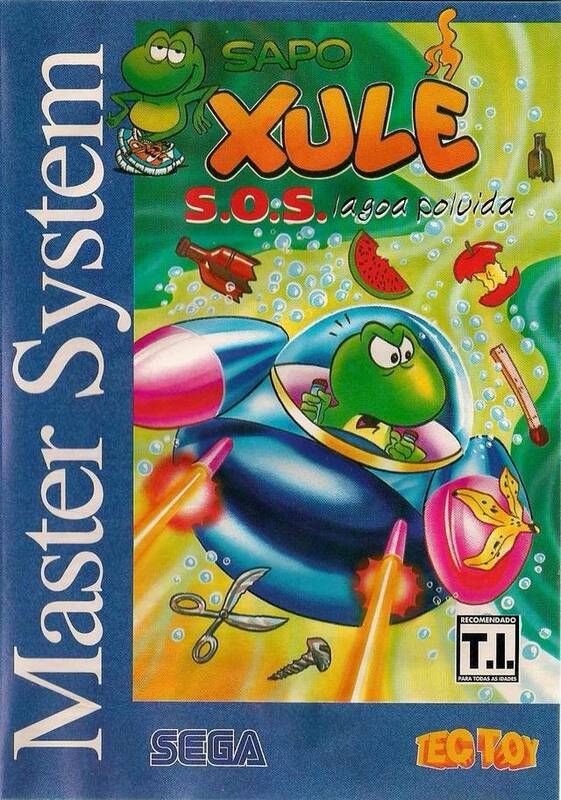 For those that love their shoot-em-ups starring frogs underwater, take a gander at Sapo Xulé: S.O.S. Lagoa Poluída or “Smelly Feet Frog: S.O.S. Poisoned Lagoon” (thanks Wikipedia!). Sapo was a retooled version of Astro Warrior for the Brazilian audience (released in 1996!) starring Sapo Xule, a popular comic character in Brazil. 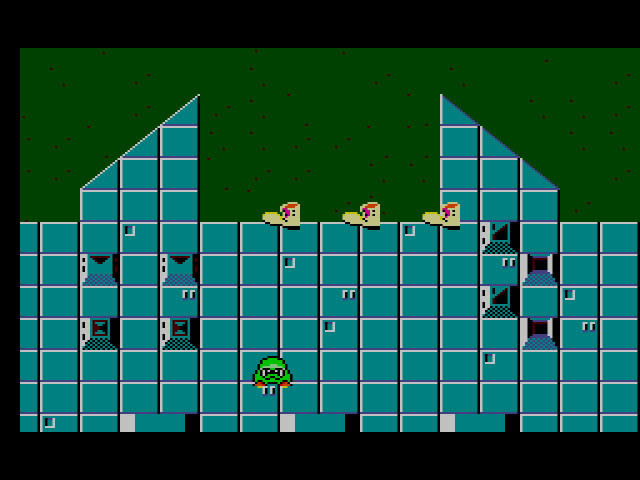 The gameplay remains exactly the same, but the main ship, enemies, bosses, and backgrounds are all modified to resemble elements of Sapo’s world. Worth playing if you like well-done hacks. Apparently only two guys were running marketing for the Master System. I don’t know if they were also responsible for the box art but wouldn’t be surprised. 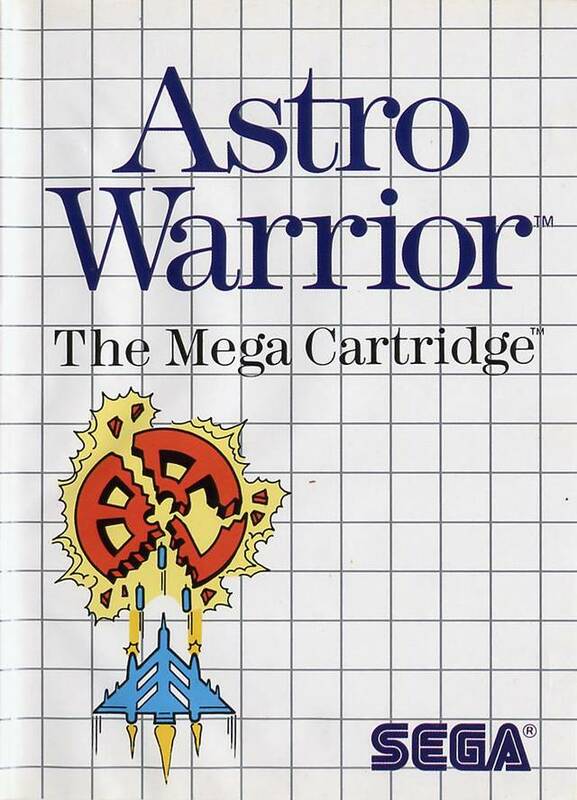 After reading all your reviews for the SG-1000 shooter games, they all sounded real similar to Astro Warrior. It very much seems like a SG-1000 game. Since you like a lot of those I can see how would like this too. But not a very revolutionary game. And rather basic. There are a few other good shooters later on on the Master System. But for me the best will be the later R-Type on master system. Easily my favorite shooter on the SMS or NES. (Yes I like it better than Lifeforce which is a close second.) This game, C sounds about right. It was nothing special but was fun for what it was, however bland and short. Yeah, I didn’t hate it, but even at this early point in the Master System’s life, Sega could do better. Still, given that Sega is STILL the only developer making games for their system, I suppose I should cut ’em some slack. This game is not that good, but I love the glowing-Christmas-tree enemy aesthetic. I am a friend of all space shooters with glowing-Christmas-tree enemy aesthetics.